In the early afternoon, seeking insights as to why today’s trading session was so choppy, I turned on financial television news. Big mistake. I soon turned off the tube in disgust. The blow-dried manikins on cable have created an alternate reality in which everything is just fine. The fact is, things aren’t fine. The trade war rages on, a recession looms around the corner, the federal deficit is reaching ruinous proportions, emerging markets are in turmoil, the seeds of significant inflation have been planted, and rising interest rates are taking their toll. But these unpleasant realities are getting tougher to ignore. Accordingly, the major stock market indices today extended last week’s rout, closing in the red after a wild day of volatility. Consider the “new” North American Free Trade Agreement (NAFTA), renamed the United States-Mexico-Canada Agreement, or USMCA. Progress on trade, right? That’s what government officials are telling you on CNBC. But it’s just not true. USMCA mostly entails what Canada and Mexico already agreed to in the Trans-Pacific Partnership (TPP) agreement. TPP was scuttled in 2017 by the White House for being a supposedly “terrible” deal. It couldn’t have been that terrible, because USMCA includes several TPP provisions that were left intact, such as looser protections for Canada’s farm products. In many ways, USMCA is worse than NAFTA. USMCA was crafted to give greater weight to regional trade relationships at the expense of global ones. 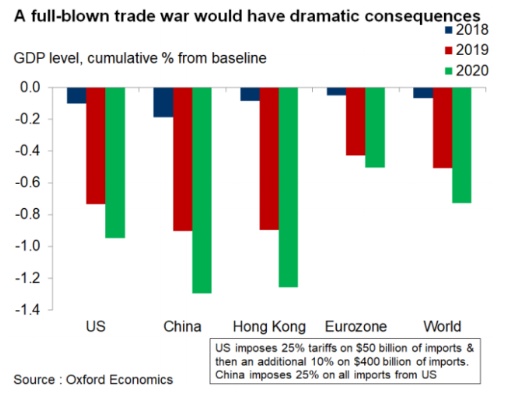 But since the end of World War II, the expansion of globalization has exerted a deflationary bias to the global economy. The USMCA, the U.S.-China trade war, and the U.S. abrogation of other multi-lateral trade treaties are spawning a more divided world economy, riven by competing regional trade blocs. The result will be higher prices for everything, for everybody. Will the White House and Beijing call off the trade war? Unlikely. China’s leaders can’t be seen as surrendering to Trump’s trade demands. For his part, Trump can’t afford to be perceived by his base as “soft” on China. Ford (NYSE: F) recently announced that tariffs have already cost the automaker $1 billion in profits and it’s preparing massive layoffs. Then there’s the ballooning U.S. federal deficit, which is running at over 4% of GDP. This stimulus is arriving at a time when the official unemployment rate, at 3.7%, is the lowest since 1969. The government will have scant fiscal leeway to fight the next recession. During the great financial crisis of 2008, enormous cross-border cooperation was deployed to rescue world capitalism from collapse. Today, due to the rise of nationalism, international relationships are frayed, even between America and traditional allies. It violates economic orthodoxy to run deficits of this magnitude during a period of “full employment” and economic expansion. This fiscal stimulus is occurring in tandem with protectionism. Small wonder that the yield on the 10-year Treasury benchmark bond rose today to exceed 3.15%, the highest yield level since May 2011. American consumers have been conditioned by decades of disinflation. They’re in for quite a shock, when the prices on their beloved flat screen TVs start going through the roof. The political blowback will be harsh. Most analysts expect a recession in 2019. Recoveries tend to last eight years; this one is nearly nine years old. The steady rise of bond yields shows that the bond market already intuits this reality. I’m skeptical that third-quarter earnings performance will provide the necessary impetus to outweigh these risks. To be sure, earnings have been strong, as reflected by third-quarter operating results released this morning before the opening bell by Bank of America (NYSE: BAC). BofA posted earnings per share (EPS) of 66 cents, beating the consensus forecast of 62 cents. Revenue reached $22.8 billion, versus the $22.6 billion estimate. It still wasn’t enough to please analysts; BAC shares today fell 1.90%. The big banks have posted robust third-quarter earnings so far, but much of this growth stems from tax cuts, a temporary shot of steroids that will fade and exert lasting harm down the road. In return for these tax cuts, we all face a day of reckoning. Wall Street is shortsighted in this regard, but you needn’t be. Actions to take: Reduce your portfolio’s exposure to stocks that are vulnerable to inflation and trade war, especially large-cap industrial and technology exporters. Buy inflation hedges, such as gold, and raise cash levels. Emphasize value and transition to stocks that perform well during the late stage of a recovery, notably consumer staples and health services. Hunker down for more volatility. The perpetually cheerful hucksters on TV won’t tell you the truth. It’s bad for ratings. But investors ignore the truth at their peril. Sears Holdings (NSDQ: SHLD) never grasped the truth about e-commerce. Once the world’s biggest retailer, Sears hasn’t been profitable in more than seven years. Today, the fallen retail icon filed for Chapter 11. A moment of truth can be postponed, but not forever. Electronics maker to merge with Harris. Communications firm to form aerospace/defense giant with L3. China-based electric vehicle maker posts quarterly deliveries beat. Storied retailer files for bankruptcy protection. Analysts express concern about oilfield services firm’s debt. “What portfolio allocations do you recommend now?” — Nate L.
Securities law prevents me from providing individualized investment advice. But as a general rule, re-calibrate your allocations to 35% stocks, 30% hedges, 25% cash, and 10% bonds.